The USS CORONADO (LPD-11), the eighth Austin class amphibious transport dock, was commissioned on 23 MAY 1970. Built by Lockheed Shipbuilding in Seattle, Washington, CORONADO's construction was delayed by a year long strike. After commissioning and shakedown training at Guantanamo Bay, Cuba, CORONADO took up duty with the Atlantic Fleet. After ten years of Atlantic service, CORONADO was re-designated as AGF-11, a miscellaneous command ship for duty in the Persian Gulf. Serving in the Middle East until October, 1985, her next station was Gaeta, Italy. Moving on to Pearl Harbor in July, 1986, CORONADO spent the next five years homeported in Pearl, then changed station to San Diego, CA in August 1991. The remainder of her service life had CORONADO based in San Diego, but undergoing a number of changes. She was the first U.S. Navy combatant to have female crew members. 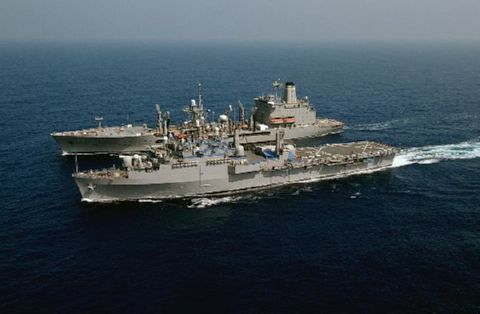 For a short period CORONADO was transferred to Military Sealift Command, but returned to Navy commissioned status due to Fleet requirements. CORONADO hosted number of innovative command technologies including, the GroupSystems collaborative real time joint command decision platform. USS CORONADO served her country for 36 years, 4 months and 7 days, until decommissioned on 30 SEP 2006. USS CORONADO is laid up at the Naval Inactive Ships Maintenance Facility, Pearl Harbor, HI.